Mental health issues are one of the most daunting challenges a family can face. The human mind is in many ways a mystery, and mental health issues have been taboo in our society for far too long. In the last few decades, however, we have come to understand many diagnoses in a more sophisticated way. While diagnoses like Autism Spectrum Disorder, Nonverbal Learning Disorder, and Pervasive Developmental Disorder can be frightening and overwhelming, families dealing with these conditions should know that they are not alone. It can be incredibly painful for a parent to have a child whose needs are going unmet. The frustration of not being able to understand or connect with one’s own child is devastating. Watching them suffer emotionally, or fail socially and academically, can be unbearable. What parent wouldn’t do everything in their power to alleviate this situation? 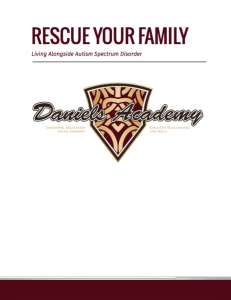 Daniels Academy is a safe haven for adolescent boys and young men who may have been diagnosed with Autism Spectrum Disorder, Nonverbal Learning Disorder, Attention Disorders, Anxiety Disorders, and Pervasive Developmental Disorders. Daniels Academy provides a nurturing setting for these young men where they can continue their academic education, receive clinical treatment, and broaden their social and life skills. Daniels Academy offers clinically sophisticated treatment in a home-like setting; our students learn together, eat great food, develop independent living skills, and have adventures in the beautiful Utah wilderness not far from our campus. Their treatment and daily life is overseen by educators and clinical professionals.